Plant experts in South Africa have a challenging deadline to meet: gather everything that's known about the country's 21 000 indigenous plant species into a formal online record by 2020. Fortunately they are well on their way. It's not just an academic exercise; it's to help preserve the world's biological diversity. 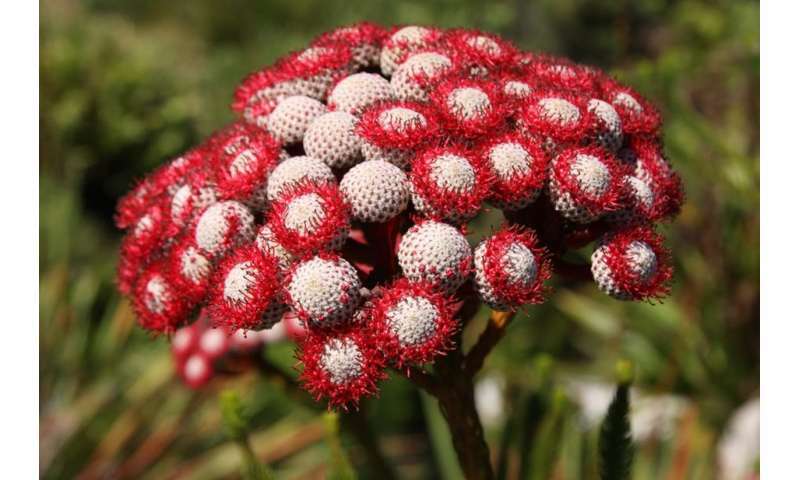 The South African National Biodiversity Institute (SANBI) – also helped in this effort by volunteers – has an important contribution to make as a member of the World Flora Online (WFO) Consortium. The 41-member group is creating a central record of the world's plants by 2020. This list, known as a Flora, is a description of all species and where they are found. The online Flora project addresses three problems that stand in the way of plant species conservation. One is that some plants have not yet been scientifically named. Without a name, they can't be part of a conservation plan. The second problem is that names can change and multiply, creating confusion for researchers and managers. Thirdly, there is no single collection of information about all the world's plants. Whenever a new plant species or any other living organism is discovered, it must be named. Through formal naming (the process of taxonomy), a species is clearly defined and described. Its definitive characteristics are highlighted along with its relationships to other species. The International Union for Conservation of Nature evaluates the risk of extinction of species and informs conservation plans, policies and legislation. But it can only do so for formally recognised living organisms. It can't protect an undescribed species. Taxonomy is not a static science. As more information becomes available, taxonomists try to improve classifications. Sometimes they rename species but not everyone uses the same name. Consistent naming is important because names should precisely match the properties of organisms. Environmental managers need this information to guide their strategies. Taxonomic information is scattered throughout a vast collection of journals, theses, popular articles, books and electronic sources, some of which can be difficult to access. There is no single, up-to-date source of plant species' scientific names. A Flora that makes information more accessible and easier to share will support the Global Strategy for Plant Conservation, which the United Nations' Convention on Biological Diversity follows. The convention promotes conservation, sustainable use and equitable sharing of genetic resources. South Africa has signed the convention and therefore takes an active part in carrying out the global strategy. Compiling the Flora is an immense task. In 2012, the Missouri Botanical Garden, New York Botanical Garden, Royal Botanic Garden Edinburgh and Royal Botanic Garden Kew joined forces and established the World Flora Online to take it on. The World Flora Online Consortium has since expanded and now has 41 members working together on data aggregation. A first version of the World Flora Online portal was launched in Shenzhen, China in 2017 during the International Botanical Congress and is available online at http://www.worldfloraonline.org/. The South African National Biodiversity Institute became a member of the Consortium in 2013. Approximately 6% of the world's plants occur in South Africa, and 3% of the plants in South Africa are found nowhere else in the world. Despite this botanical wealth, South Africa doesn't have a complete, up-to-date Flora. The last comprehensive Flora was published in the Flora Capensis in 1933 and dealt with about 11 500 species known at the time. That number has almost doubled since then. The global strategy deadline of 2020 does not allow enough time to follow traditional methods of producing a Flora. Instead, existing information is being gathered from taxonomic treatments, monographs and conspectuses into an electronic Flora. South Africa is making good progress with this project. Information for almost 85% of species has been collected and the first set of data will be on the World Flora Online portal this year. The e-Flora will be maintained beyond 2020: good news for plant conservation in South Africa and internationally.